Then there are those pricey shore excursions, which in my opinion seldom give value for the dollar. Several hours on a bus, followed by an often hurried tour of some famous sites, followed all too often by a leisurely pause for shopping, followed by another few hours on the return to the ship is not my idea of a well-spent day. And so it is that I and the beautiful and mysterious woman I travel with often content ourselves with whatever we can sample within walking distance of the ship. Sometimes we accomplish little more than getting some fresh air and a bit of exercise. But every once in a while the stars align and we return feeling we have had the best shore excursion of all. The beautiful and mysterious woman I travel with – Revealed! So it was in Le Havre where we had the better part of a day to explore the city. That was because the ship docked early so as to accommodate insane tours to Paris. Two and a half hours out, two and half back and a few brief hours in the City of Light, spent mostly gawking out of the bus window. Still, if it’s your only chance to see Paris who am I to look down my nose? It was a long walk into town, longer than it seemed when looking at the map, but it gave us a chance to get the feel of the town. Le Havre was almost completely obliterated in World War II. It was rebuilt as a sort of modernist take on Paris, what you might call Hausmann on a budget. The result is tidy but rather drab, with the monotony being broken by some grand boulevards and spacious parks. 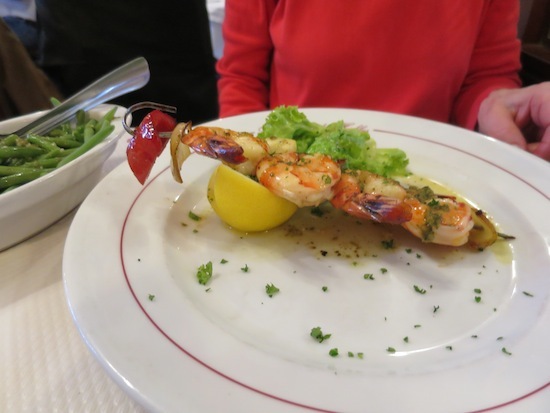 Yes there are attractions in Le Havre, museums, churches, a cathedral, but for us the main attraction on this our one day in France on a 16-day cruise was good French food. If we could find it! 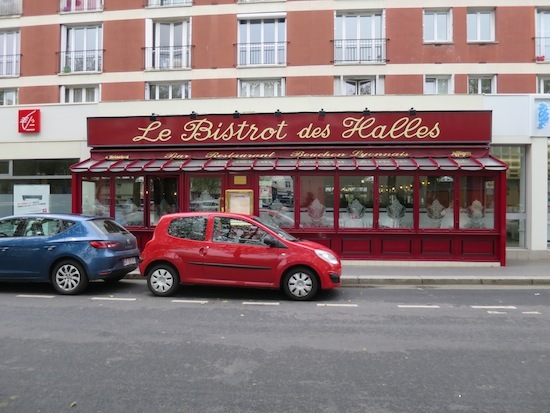 Fortunately, we chose Le Bistrot Des Halles, just across from – where else? – the central market. The market itself is worth a visit, showing off as it does the French understanding that great food begins with great ingredients. All of it here is displayed ravishingly and with great care. We couldn’t help noticing that one stall had the foresight to offer the freshest little strawberries in small, carry-along-and-eat-as-you-go containers. 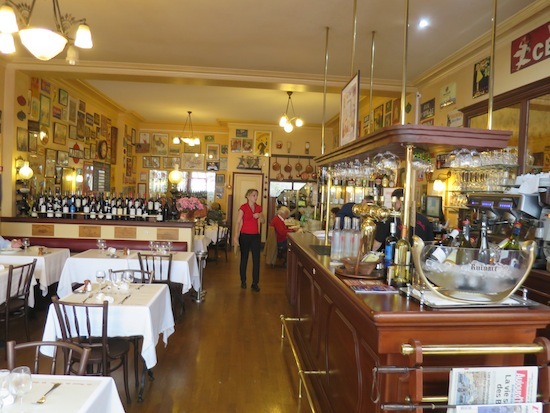 Le Bistrot des Halles – Interior. 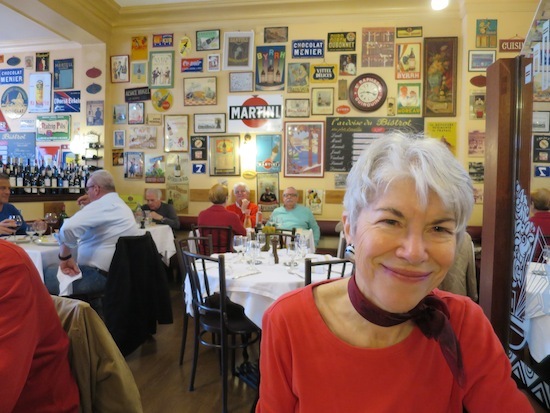 And best of all, the sort of place where the food is French through and through with everything “fait a maison” and presented pleasingly but with no hoity-toity affectations. I dove right into the 24.80-euro menu (about $28 US), which offered plenty of choices in all three courses. The Soupe de Poissons (a Bistrot specialty), which comes with croutons, grated cheese, and an aioli on the side was a superb starter, a deeply satisfying puree redolent of the sea and strongly spiced. 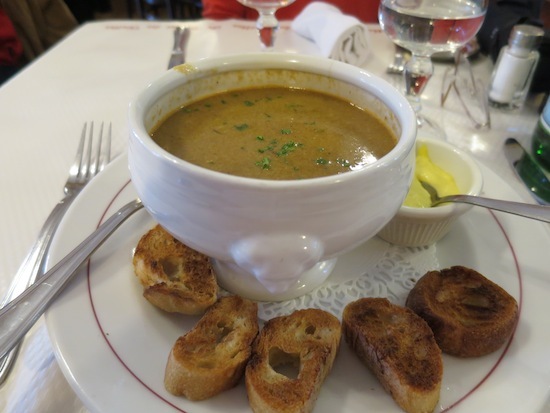 Soupe de Poissons is a Bistrot specialty. The cassoulet was another house specialty and must have contained a least a pound of meat and sausages along with wonderfully garlicky beans. It was so good I felt compelled to apologize to the waiter for failing to polish it off. (He understood. “Oui, c’est copieux.”) But I was intent on dessert. 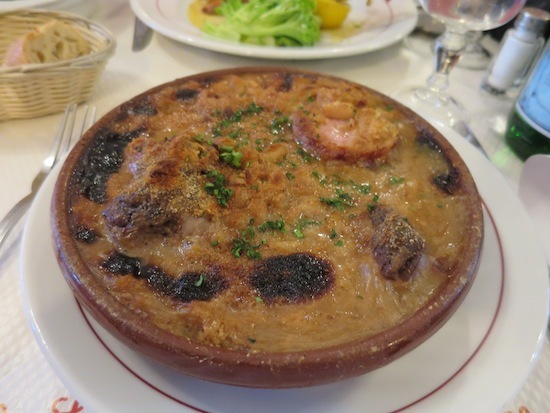 The cassoulette contained at least a pound of meat and sausages, along with garlicky beans. 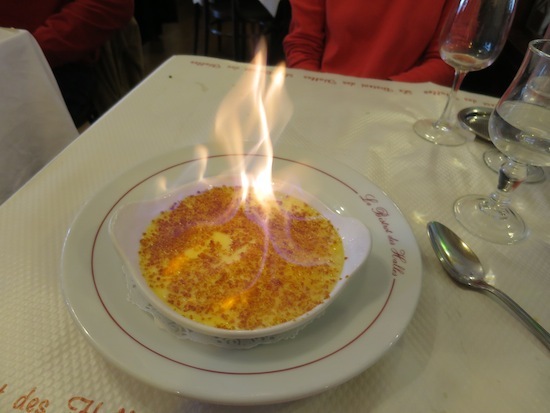 The creme brulee was not only larger than those I usually get at home, but it was flambéed, adding a festive touch. The beautiful and mysterious woman I travel with was more restrained, ordering a lovely brochette of meaty shrimp over which the waiter poured a flaming whisky sauce. A side of simply cooked green beans was a perfect accompaniment. The lovely brochette of meaty shrimp was topped by a flaming whiskey sauce. With a large bottle of San Pellergino, two glasses of inexpensive but perfectly serviceable house wine, and two cafés allongeés to end the meal, the bill came to about $66. Money well spent. Thus fortified, we sallied forth in search of cultural enrichment. A museum perhaps?